ZEBULON, N.C. - The Carolina Mudcats are excited to provide details today regarding some of the new features coming to Five County Stadium this season. The all-new #GoMudcats fun features coming to Five County Stadium this season include new concession items, new team identities, Wake Med $5.00 Five County Family Sundays, B.O.G.O. Mondays, House Autry All-You-Can-Eat Tuesdays, Thirsty Thursday featuring $1.00 Bright Leaf Hot Dogs, the Johnston Health Family Section and new partnerships with Papa John's Pizza and Pepsi. Many of these new features will be in place in advance of Carolina's first home game of the 2019 season set for Thursday night at 7:00 p.m. at Five County Stadium. Thursday's home opener is also the first game of a seven game home stand that will feature four games against the visiting Wilmington Blue Rocks from April 11 through April 14, and three games versus the Fayetteville Woodpeckers, April 15 through April 17. Individual game tickets, season ticket plans, group ticket packages and the latest mini plans are all available now by visiting the Five County Stadium front office, by calling (919) 269-CATS (2287) and by visiting carolinamudcats.com/tickets. The Mudcats are proud to introduce a new partnership with Pepsi this season. Fans can now exclusively enjoy Pepsi products throughout Five County Stadium all season long. New food options abound at Five County Stadium this season as the Mudcats are thrilled to introduce a slew of new menu items. The new additions include "The Ribby" rib sandwich available at the Cane Pole Cantina stand and the new Pueblo de Taco stand featuring mexi-dogs, carnitas (beef and chicken), elote and taco nachos. The Mudcats are also bringing "Kona Ice" to Five County Stadium this season as the Kona Ice truck, aka "The Kev," will be on site near the "Catfish Corner Grill" stand on the first base side. Kona Ice serves Hawaiian style fun flavorful shaved ice. Papa John's Pizza returns as the official pizza of the Mudcats this season. Papa John's personal pizzas will be available throughout the Five County Stadium concourse and pizza by the slice options will be available in the Five County Stadium premium level suites. Papa John's will also serve their baked chocolate chip cookies as part of the Mudcats' "Muddy Meals" this season. The Mudcats and Wake Med are excited to introduce Wake Med $5.00 Five County Family Sundays this season. This new weekly, recurring, promotion features $5.00 box seat tickets for all fans residing in one of Five County Stadium's five counties including Wake, Franklin, Nash, Johnston and Wilson. This special ticket offer applies to all Sunday day games and is available to purchase through the Five County Stadium box office. Wake Med $5.00 Five County Family Sunday games will also include discounted $2.00 Aquafina water bottles available at the Five County Stadium concession stands. Wake Med $5.00 Five County Family Sunday games also feature free admission for Wake Med Muddy's Buddies Kids Club members; Wake Med is the new presenting sponsor of the Muddy's Buddies Kids' Club this season. Carolina's all-new Buy One, Get One Monday, or B.O.G.O. Monday, promotion features a buy one (1) box seat ticket and get one (1) free ticket promotion for each Monday night home game throughout the season. The Mudcats have partnered with House Autry to introduce House Autry All-You-Can-Eat Tuesdays this season at Five County Stadium. House Autry All-You-Can-Eat Tuesdays will include all-you-can-eat House Autry hush puppies and all-you-can-eat Bright Leaf hot dogs from 6:00 p.m. through 8:30 p.m. during each Tuesday night home game throughout the season. The all-you-can-eat menu will apply to every fan in attendance; fans will be limited to three items per trip, beverages will not be included. Thirsty Thursday once again features half priced draft beer, half priced bottled Pepsi products and - new this year - a value menu featuring select $1.00 food options, including $1.00 Bright Leaf Hot Dogs and $1.00 small popcorn and tacos. The Mudcats and House Autry once have once again teamed to present the areas most exciting fireworks show as House Autry Friday Night Fireworks shows follow each Friday home game throughout the season. The Five County Stadium Family Section of seating is proudly presented by Johnston Health this season. Fans attending games in the alcohol free Johnston Health Family Section will have access to sunglasses, lip balm and sunscreen courtesy of Johnston Health. Johnston Health has also partnered to present the "Kids Run the Bases" promotion following Mudcats games this season. The Mudcats, in conjunction with Minor League Baseball's "Copa de la Diversión" initiative celebrating Hispanic heritage and culture, announce that they will play as "Pescados de Carolina" for four games during the upcoming 2019 season. Carolina's new Copa de la Diversión and Pescados de Carolina identity, complete with new game jerseys and hats, is presented locally by the Dental Center at Zebulon and nationally by ECHO Power Tools, the "Official Outdoor Power Tool of Copa de la Diversión" ("Herramienta Oficial de la Copa de la Diversión"). The Mudcats will transition to Pescados de Carolina for four home games this season starting on Friday, May 24 versus Down East with live music and a sugar skull bobblehead giveaway presented by O'Reilly Auto Parts. The Pescados de Carolina series of games continues on Friday, June 28 versus Potomac, Friday, July 19 versus Myrtle Beach and Friday, August 9 versus Salem. Each of the Copa de la Diversión and Pescados de Carolina games will be followed by postgame fireworks presented by House Autry. The Mudcats are brewing up a new taste for the 2019 season as the club will temporarily re-brand for four nights only as the "Carolina Micro Brews," paying homage to their Major League affiliate, the Milwaukee Brewers. The new Carolina Micro Brews new team identity, featuring new logos, hats, game jerseys and merchandise is presented by Tryon Family Dentistry. The first Carolina Micro Brews game is scheduled for Saturday, April 13 and will feature a souvenir Micro Brews replica jersey giveaway for the first 1,200 fans through the Five County Stadium gates. Micro Brews games will additionally fall on May 9 vs. Fayetteville featuring a plastic beer stein souvenir giveaway, June 6 vs. Salem and August 1 vs. Down East featuring a bottle opener souvenir giveaway. Both giveaway items will be available for fans ages 21 and over. Season ticket packages as well as group ticket packages and the latest mini plans are all available now by visiting the Five County Stadium front office in Zebulon, by calling (919) 269-CATS (2287) and by visiting carolinamudcats.com. The Carolina Mudcats are the proud Carolina League, Class-A Advanced affiliate of the Milwaukee Brewers. 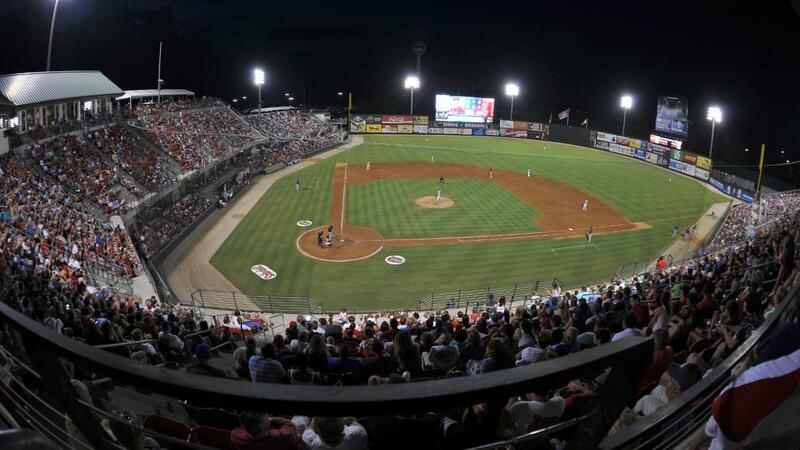 First established in 1991, the two-time Southern League Champion Mudcats are entering their 29th consecutive season of baseball at Five County Stadium in Zebulon, N.C. The Mudcats are owned and operated by the Milwaukee Brewers.